VOLVO AMAZON 121 122 PV 544 HEADLIGHTS ADJUST KIT NEW!! VOLVO AMAZON 121 122 LICENSE PLATE HOLDER KIT STAINLESS STEEL!! 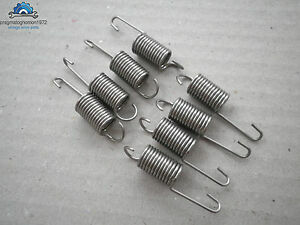 VOLVO AMAZON 122 121 544 P 1800 SU HS6 CARBS RETURN SPRINGS STAINLESS STEEL!!! pragmatognomon1972 has no other items for sale. Details about VOLVO AMAZON 122 121 PV 544 HEADLIGHTS ADJUST SPRINGS 8PCS STAINLESS STEEL!! VOLVO AMAZON 122 121 PV 544 HEADLIGHTS ADJUST SPRINGS 8PCS STAINLESS STEEL! !